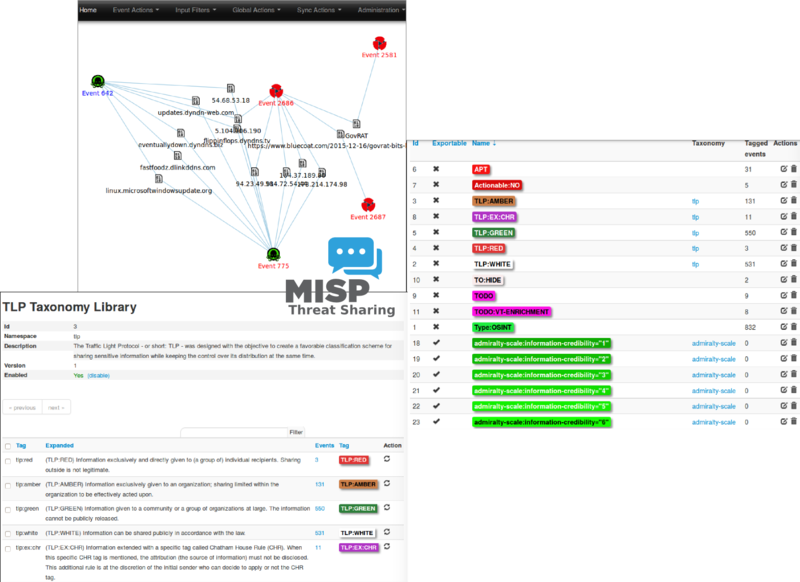 MISP, Malware Information Sharing Platform, and Threat Sharing is an open source software solution for collecting, storing, distributing and sharing cybersecurity indicators and threat about cybersecurity incidents analysis and malware analysis. MISP is designed by and for incident analysts, security and ICT professionals or malware reverser to support their day-to-day operations to share structured information efficiently. Automatic correlation finding relationships between attributes and indicators from malware attacks campaigns or analysis. Built-in sharing functionality to ease data sharing using a different model of distributions. MISP can synchronize automatically events and attributes among different MISP. Advanced filtering functionalities can be used to meet each organization sharing policy including a flexible sharing group capacity and an attribute level distribution mechanisms. storing data in a structured format (allowing the automated use of the database for various purposes) with an extensive support of cybersecurity indicators along fraud indicators as in the financial sector. export: generating IDS, OpenIOC, plain text, CSV, MISP XML or JSON output to integrate with other systems (network IDS, host IDS, custom tools), STIX (XML and JSON), NIDS export (Suricata, Snort, and Bro) or RPZ zone. Many other formats easily added via the misp-modules. import: bulk-import, batch-import, import from OpenIOC, GFI sandbox, ThreatConnect CSV. Many other formats easily added via the misp-modules. Adjustable taxonomy to classify and tag events following your own classification schemes or existing classification. The taxonomy can be local to your MISP but also shareable among MISP instances. Sighting support to get observations from organizations concerning shared indicators and attributes. Sighting can be contributed via MISP user-interface, API as MISP document or STIX sighting documents. STIX support: export data in the STIX format (XML and JSON). Additional STIX import and export is supported by MISP-STIX-Converter or MISP-Taxii-Server. Exchanging info results in faster detection of targeted attacks and improves the detection ratio while reducing the false positives. We also avoid reversing similar malware as we know very fast that others team or organizations who already analyzed a specific malware.